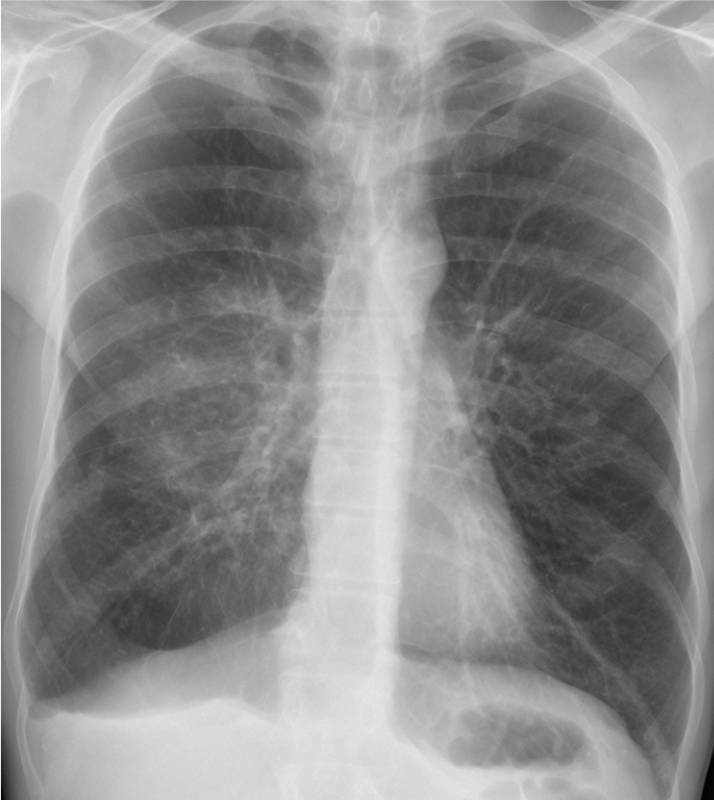 Frontal radiograph there is bilateral hikar prominent vascular making more on the right hilum, prominent translucency over the right lower zone and right pleural effusion. There is abnormal linear shadow on the left hilum. 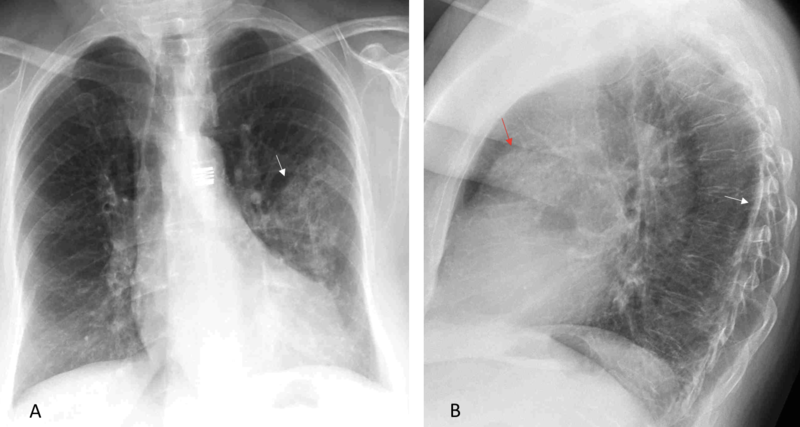 Lateral radiograph there is prominent shadowing anterior to hilum which suggested of enlarged right pulmonary artery, right plural effusion. 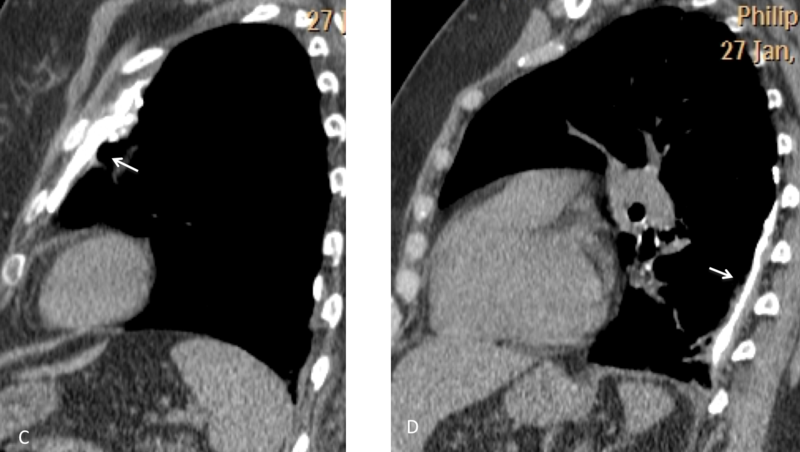 I think it is right pumonary embolism, and because of that shadow over the left hilum, possibly left PE too. 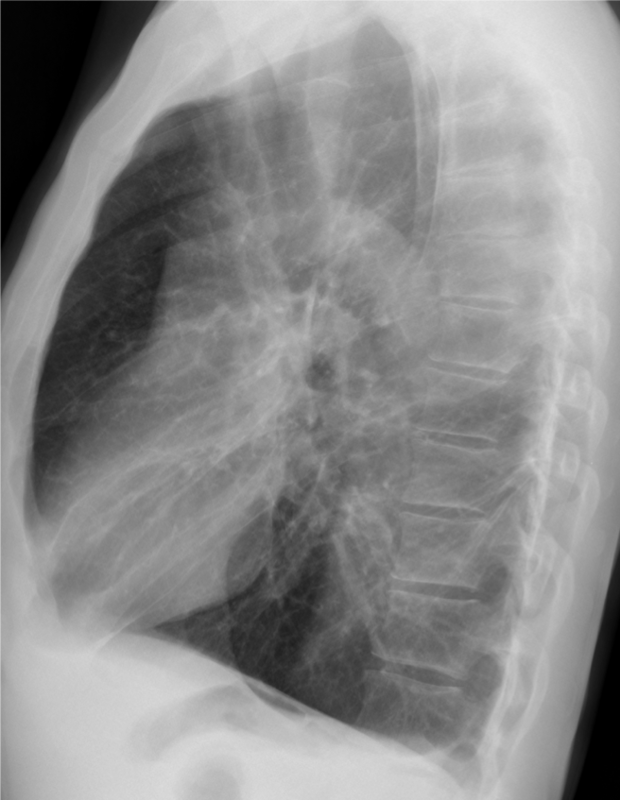 PA chest: blunting of right lateral costophrenic angle, pleural thickening in the right apex, double right diaphragmatic contour. 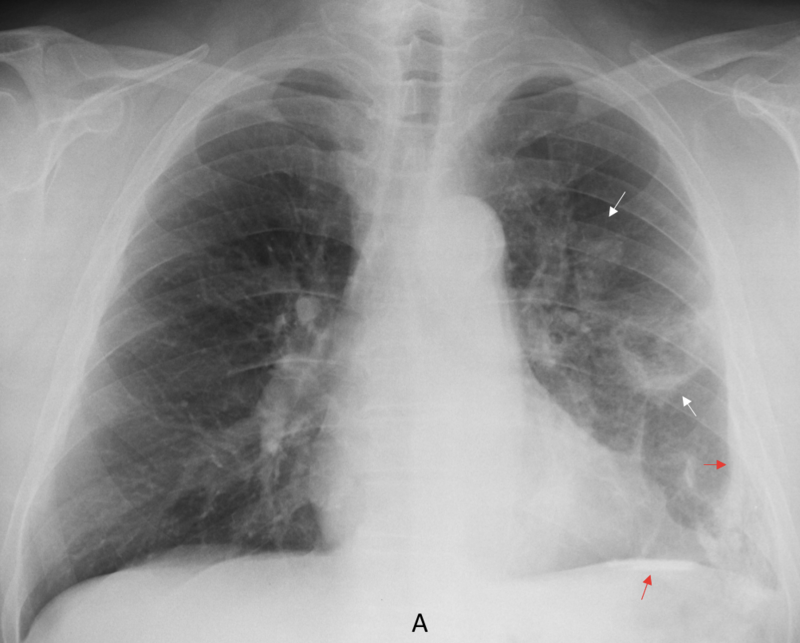 There are disorganized and coarsened interstitial markings with peribronchial cuffing, more prominent on the right with possible tubular bronchiectasis. 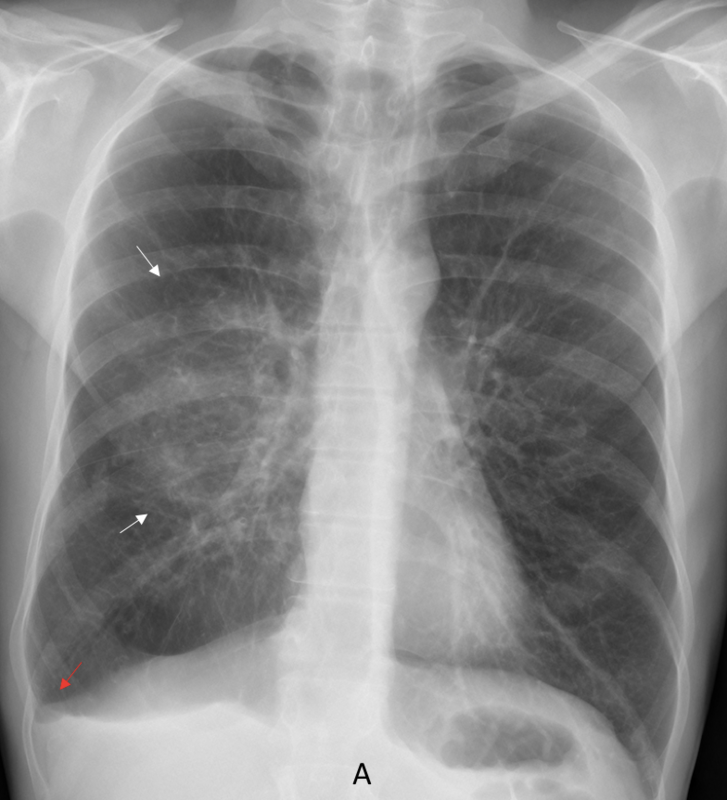 There is a subtle hyperlucency of right upper lung zone and a hazy opacity in the right middle perihilar area, however the hilum remains visible. Lateral: the opacity is posterior (mostly 6th segment, with some extension into the 10th/2nd) and associated with the pleura, possibly even originating from it, while the pleura itself is thickened and with surrounding radiating strands of fibrotic tissue. 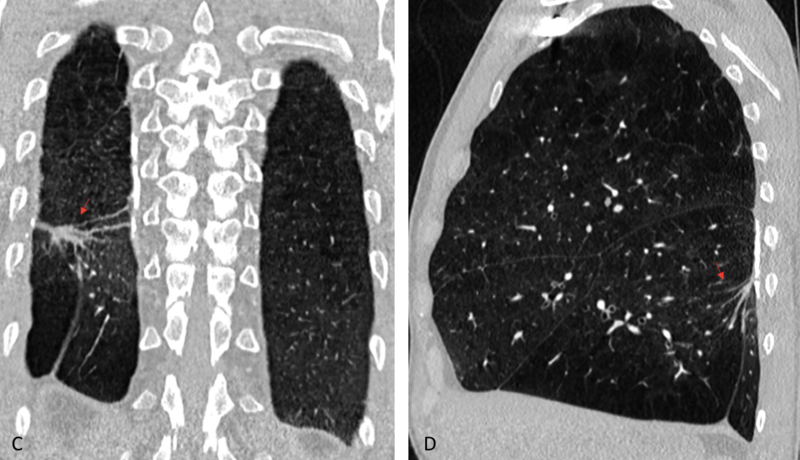 The trachea is slightly deviated to the left and anteriorly, due to rotation, with a lucency seen adjacent to it, which might be due to slight overexpansion of right upper lobe due to emphysematous changes. 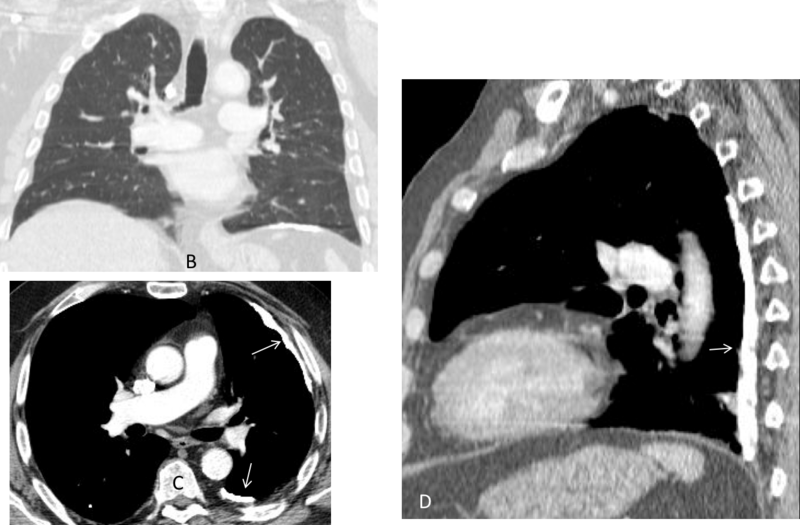 Overall the clinical picture and evelated D dimers are strongly suggestive of PE and since any CXR abnormality might be associated with PE, a CT PE protocol should probably be performed. 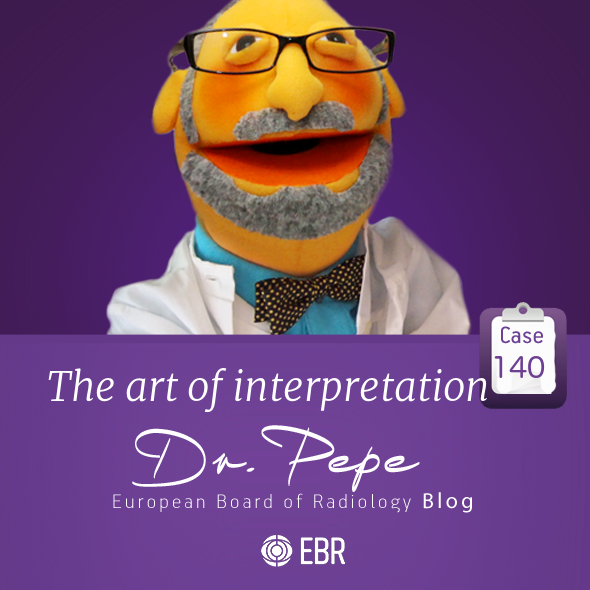 However right lung findings could also be due to chronic changes, like an inflammatory infiltrate during its resorption phase, COPD and some process involving the pleura. High D-dimer and signs to RLM atelektasis suggestive to PE. Most likely COBP too. 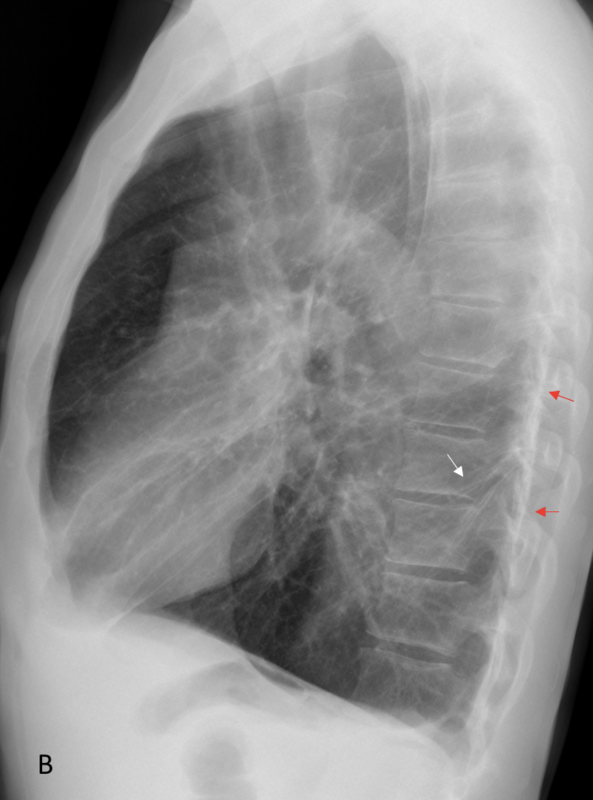 cylindrical bronchiectatic changes in both lungs , mainly in central and bilateral lower lobes. few of dilated bronchi show air fluid level suggesting superinfection. 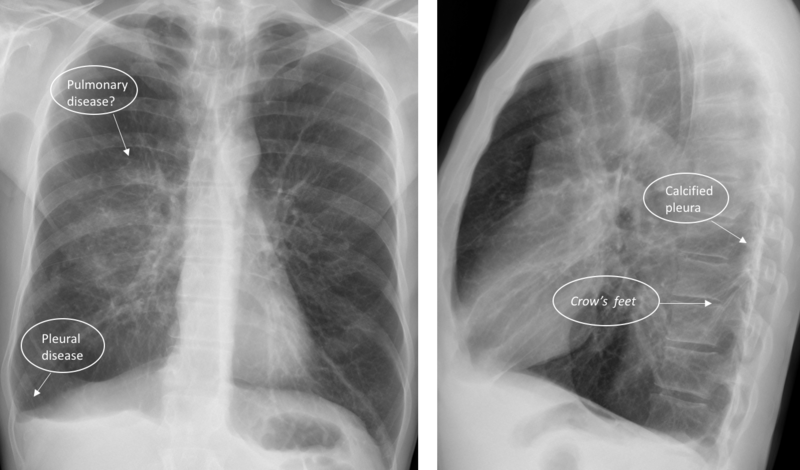 both lungs show changes of chronic bronchitis with right lower lobe appearing more hyperluscent with flattening of hemidiaphragm ,probably bulla in lower lobe. ill-defined opacities with obscured margins in right para hilar location suggesting consolidation. summary chronic bronchitis with bronchiectatic changes with consolidation in right parahilar region. Since we are in Holy Week, I will give you a tip. 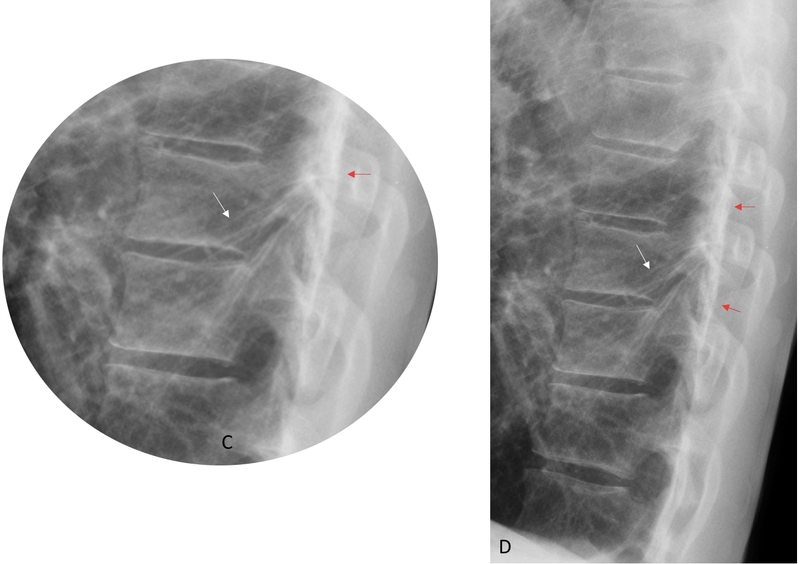 There is a negative finding: the pulmonary infiltrate in the PA radiograph is not visible in the lateral view. Why? Do you see it outside?